So this weekend I found the time to sit down and play with some papers. Due to Christmas closing in (and I’m totally unprepared so far) I dug out some Christmas-papers and go really inspired. 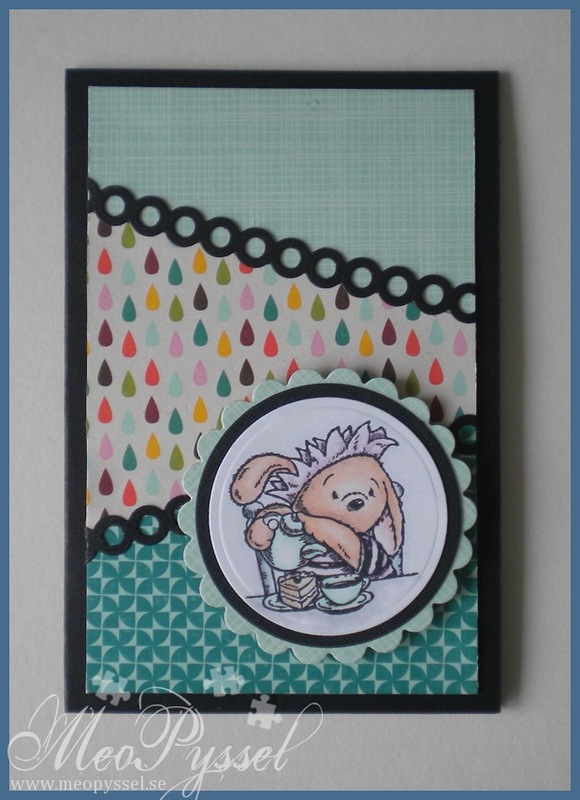 I have to admit that I made this card pretty quickly and I didn’t like it from the start but it really grows on me. 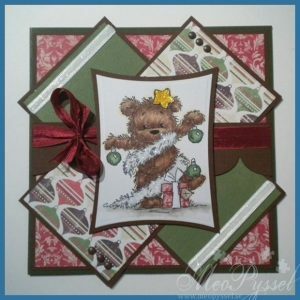 The papers I used is from Echo Park’s collection Very Merry Christmas and I just love the nice colors, they are deep and soft at the same time – and the paper with the ornaments are just so darling. I chose the James Bear from Lili of the Valley to go with my card and i colored him with my copics. 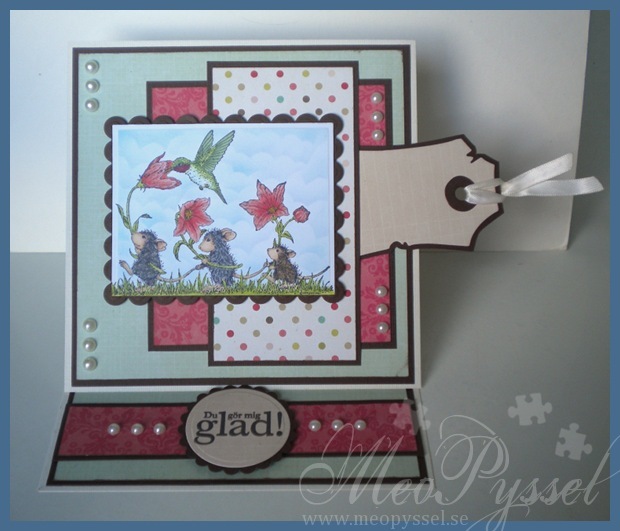 The little gift have been paperpieced with the backgroundpapers. I wanted to try to keep some parts white, I usually don’t and I always regret it. So the tinsel is white and i have glittered it with some Martha Stewart glitter and I used the same glitter on the white ribbon. I used a strip of my dubbelsided tape and just glittered one side. I really like how the white glitter ties the card together and the fact that the “strips” goes in a similar angle as the tinsel. The star is first colored and then coated with yellow stickles. The ribbon is from stampin’ up and i love how easy it is to tie it, i usually use satin and its really hard to get the bows to stay tied- this was easy and really looks soft. The inside is simple with a “Merry Christmas”-greeting and some vertical strips of the ornament paper one the sides. This card is for a fellow teacher that have found another job. Unfortunately I’m still a bit stressed and exhausted so I can’t say that I’m happy with it, or even making it. But it u´turned out OK. I just wish I made the sentiment more like a tag, creating some life. The “splashes” is some water, distress ink and glossy accent. The sentiments is latin and means something like “We know you will miss your colleague, drown your sorrows”. 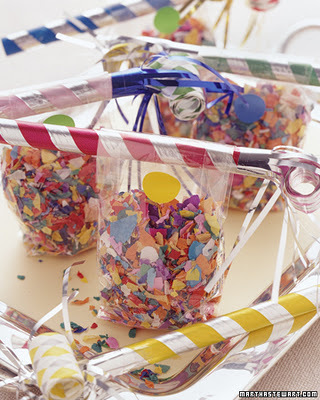 Due to the sentiments and the fact that the gift we got was beer-glases I did the splashes thinking of beer-drops. 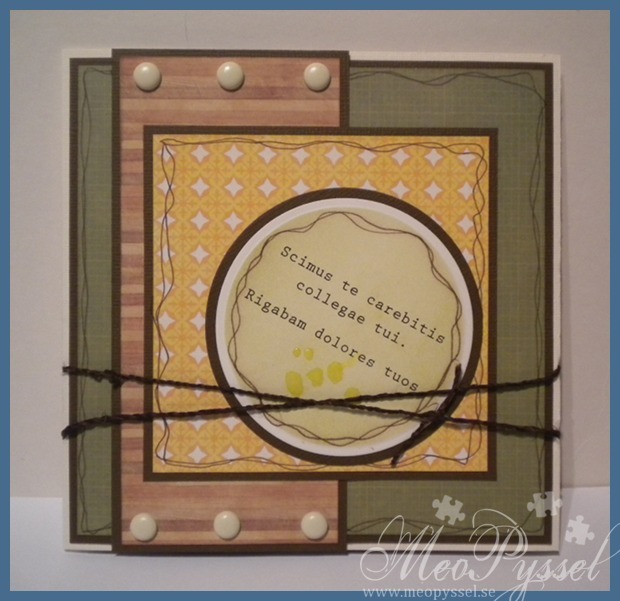 Dies: Distress Ink – Peeled Paint, Mustard Seed, Vintage Photo, Shabby Shutters. 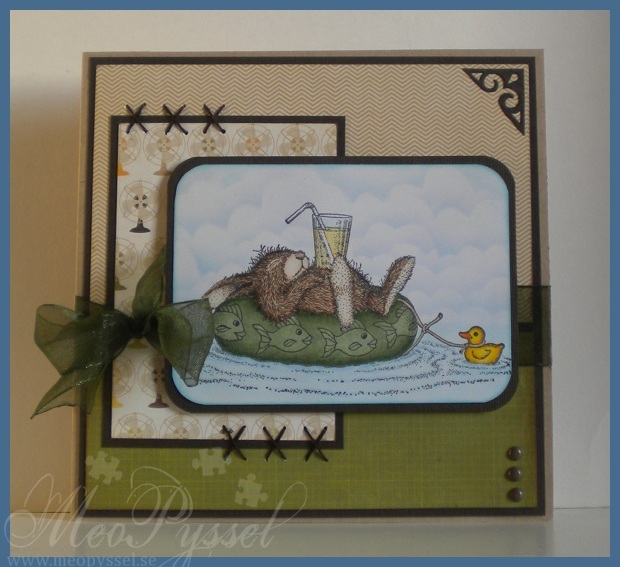 This week on the Sweet Stampin’ Challenge we are running the theme Stitching. 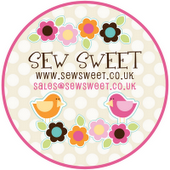 We’re sponsored by the super sweet Sew Sweet who are offering one lucky person picked at random a £10 voucher for the shop which stocks a gorgeous array of wool, felt & haberdashery items. We also have our monthly sponsor Joanna Sheen, who are giving one lucky winner a £10 voucher. Next week is my baby brother’s 22 birthday and of coarse I have to make him a nice card. Last week i bought the This and That: Charming from Echo Park and the paper with the fans just got my thinking of summer. I also love this collection because it works perfectly for masculine cards. The image is a Happy Hoppers called Bunny Cruise. This is the first time I use it and I have to admit that I had a real blast coloring the bunny. On the other side i did two failed attempts on the bath-ring, but that was more my copics fault then the image. I had a hard time finding a color-combination that would match this papers. The image is a bit more yellow, especially on the green, due to the fact that the photo was taking during sunset. The image is as usual colored with copics and the clouds are Tumbled Glass. 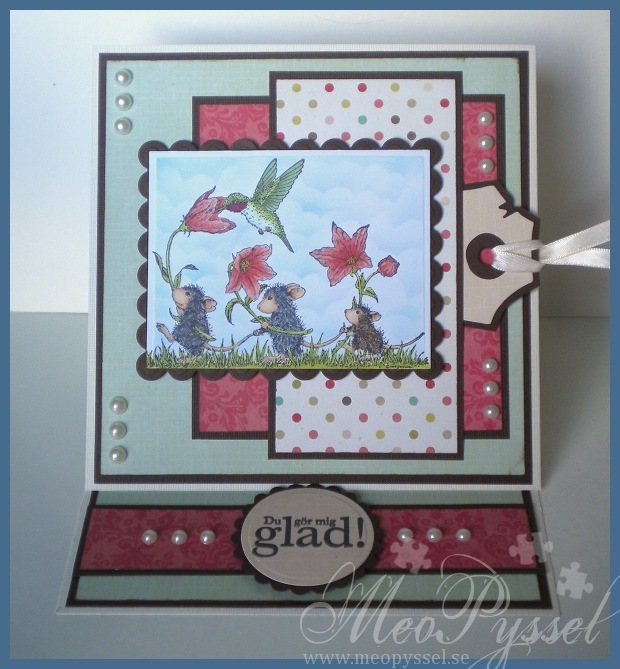 The corner decoration at the top right corner is one of the corner-decorations in the Vintage set from provocraft. But the part you see is only the most inner part, the rest i cut away. 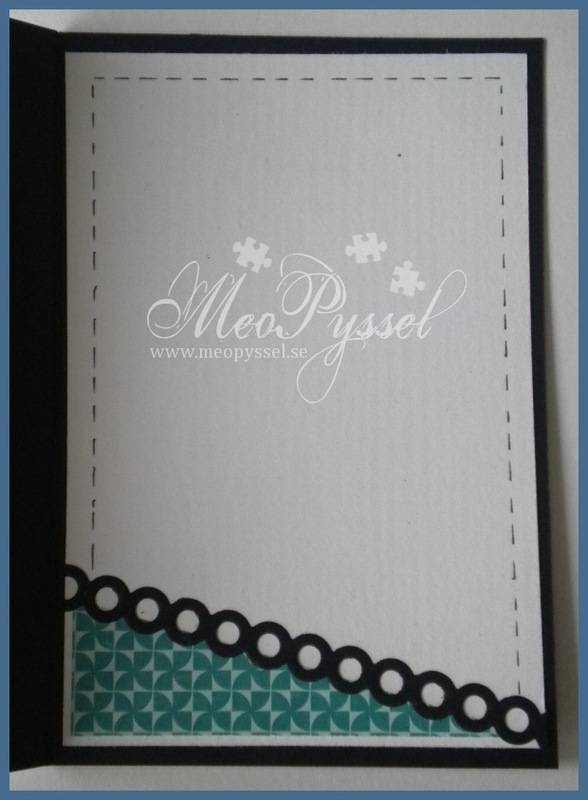 The ribbon is tied with a nellieknot, and I think that really gives something extra on the inside of the card, i never decorate that side anyway. The stitching is made with some embroidery-thread, and i spaced the holes with the Tim Holtz ruler. The inside is just continuing at the same theme, and the stitching. Other: Distress Ink – Tumbled Glass. EK Success – Corner rounder medium. 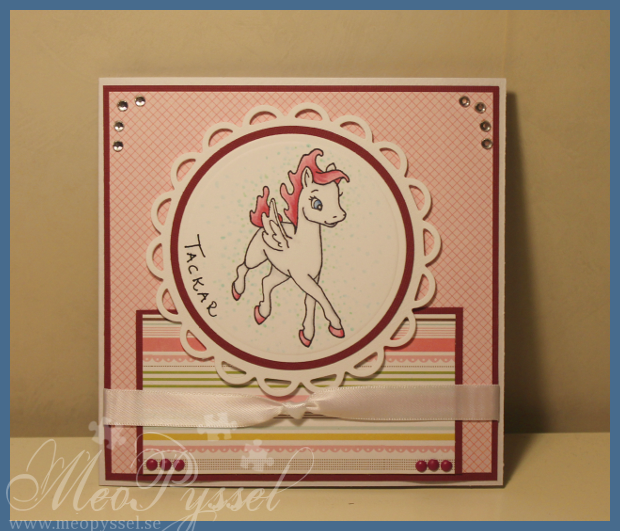 Provocraft – Vintage. 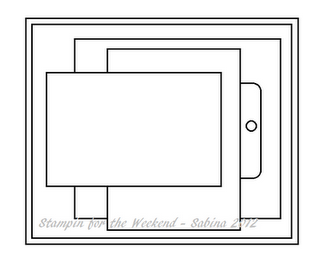 So this weeks challenge for Sweet Stampin’ is “anything but square” so I thought I’d try my first round easel. Our sponsor for this moths is Joanna Sheen that will give a £10 gift voucher. As soon as I saw this lovely image from Di’s Digis i immediately thought of the Ljusteräng family, and especially Andreas. Andreas is a musician and will among other things play on my wedding. His son and my godson Theo will probably grow up to be one too and I though that this bear would be so cute for Theo. I’m really happy with how the coloring of the fur turned out. I went for a longhaired bear and it really turned out good. I’m not very happy with the drums but i honestly have no idea how to make it work. The white of the hat is not colored because i forgot it until i took the photo. I looks really good but I will probably shade it a bit with E40, E41 if I find the time this weekend. The edges of the circle (and the nameplate) is distressed with Antique Linen. The paper on the bottom part is from Echo Park’s collection This &That: Charming and I did use that paper as inspiration when I colored. The nameplate is made with one of Spellbinder’s Grommet Tags. 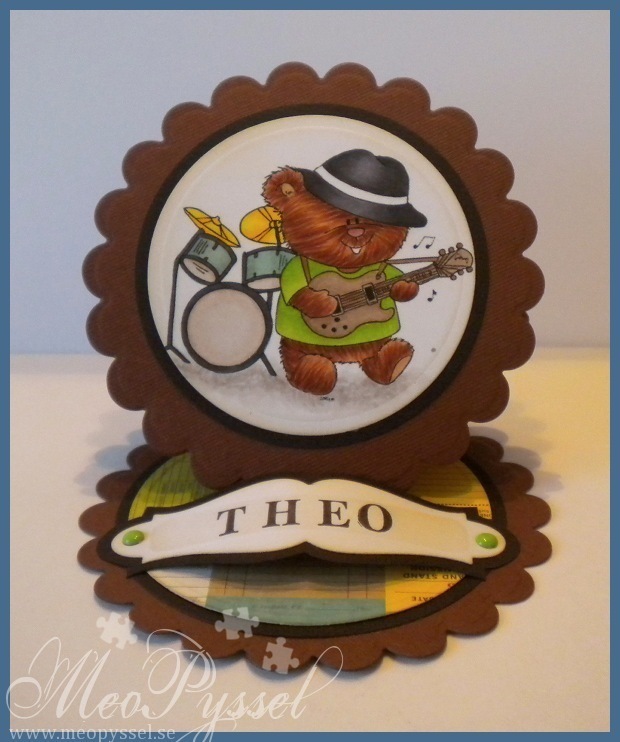 The name Theo is stamped with some clearstamp letters i had from an Exchangeable Clearstamper-sets featuring Baby-things and the brads are from Paperwishes. The nameplate is not fastened with any foam-dots or other adhesive or anything dimensional, it’s keeping up due to the fact that the brads is closer together then they “should”. Other: Spellbinders – Nestabilities – Large Scallop Circle, Large and Small Circle. 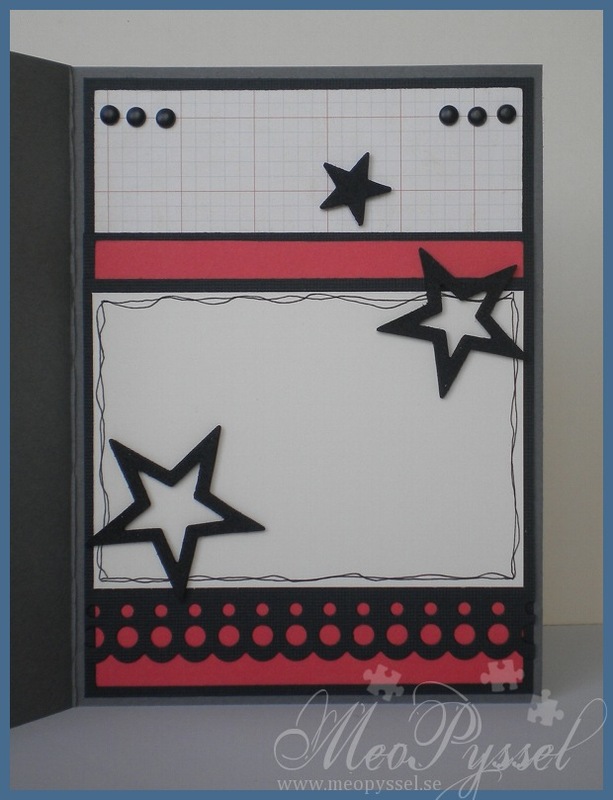 Spellbinders – Shapeabilities – Grommet tags. Distress Ink- Antique Linen. I have to admit that i have fallen head over heels with the deer and the squirrls from the Greeting Farm’s Forest friends. I did stamp up some during the scrapgathering but im starting to run low on them,so i just HAD to order the set for myself – a good use for the money i got from my grandma in cristmas gift. Some other (lots…) find it’s way into my ordering-baskets so I can’t wait for my mailbox to be full of goodies, but it will probobly be for after the 7th when i get home again from the baptism of my godson (that’s the card that is comming up). I have been thinking a lot about this card, especially the papers and I have been wondering what would be suitable as a focal to them, so after some thinking i decided that the Deer would be good- as a raindeer-feel. So i colored the Deer with Copics, and got happy with it and then started to pull a couple of papers from the Holly Jolly Christmas-collection from Echo Park, then i got some cardstock to match and put it all in front of me. And then i spilled the biggest glass of milk over it all! Let’s just say that it was annoying and that i dried all the papers with my embossing-gun. All paper was ok, a bit wobbly but ok, except for the deer so i had to redo him, i have to say that the second one got a bit better- but still…. 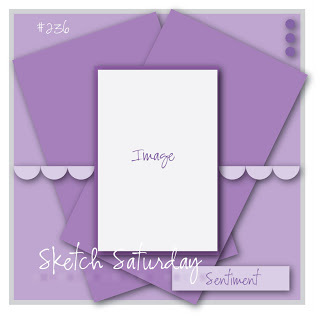 I used a Cute Card Thursday’s Sketch for the layout, just changing a bit. I also followed the colors of this weeks Shabby Tea Room. The decorations on this card is mostly the rhinestones and the ribbon but i also put a hint of diamond stickles on some of the christmaslight-paper. The background of the Deer is made with some nestabilities (scalloped and normal oval) and the white paper is embossed with Provocraft’s embossingfolder Snowflakes. The greeting is stamped with the distress Ink Gathered Twigs. Other: Diamond Stickles. Distress Ink – Gathered Twigs. Colored Rhinestones. So i have finally finish this card off! The pieces have been laying on my desk for almost two week waiting for the border that will create the contrast. 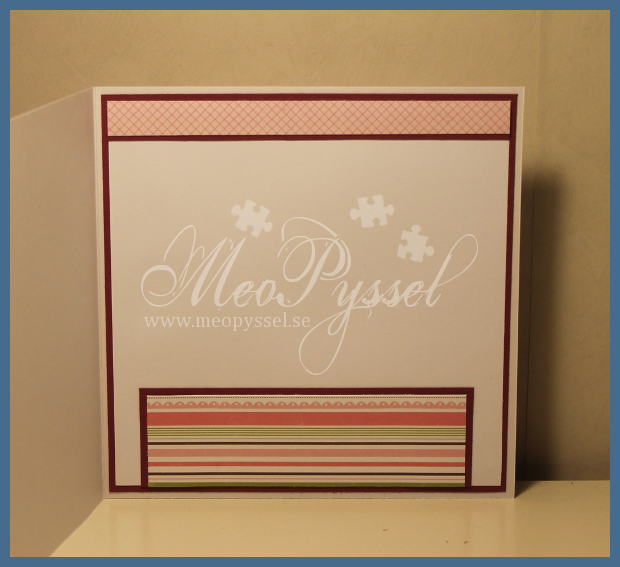 I did the layout out of one of Amy Rysavy’s cards that i really liked, you can see it here. I love how she combined the colors and the image. I think that I succeeded with getting the colors from the paper into the image but hers i better balanced. The black border got a bit harsh but i really couldn’t find a better color in my stash. The papers is from Echo Park’s collection A walk in the Park and the die that is used for the borders are Dainty Dots from MFT. 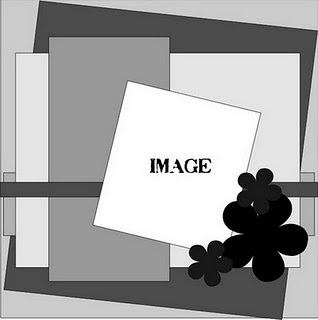 The framing around the image is made by nestabilities circles and scalloped circles. Dies: Nestabiliet’s small and large circle and large scalloped circles. MFT’s Dainty Dots. When I was ready to leave my desk for the day i found a Sketch that i really like and I immediately thought about my Echo Park papers. As said this is Echo Park’s paper and they are all from the A Walk in the Park-collection. 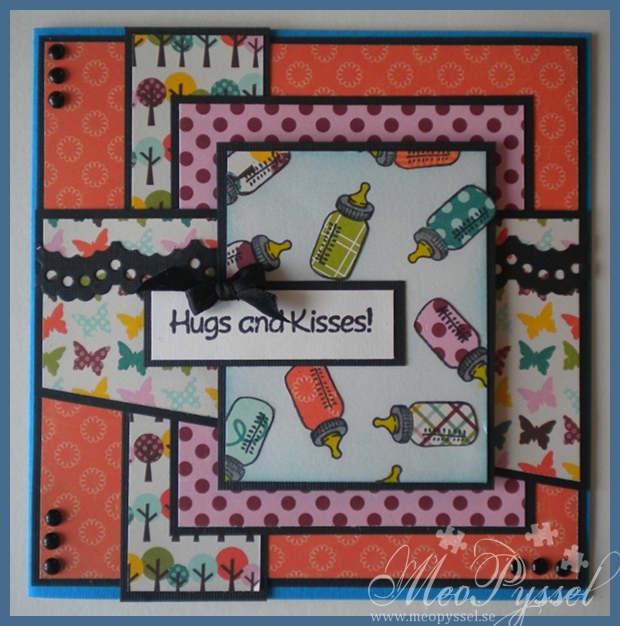 The main image is made using the bottle from Kraftin Kimmie’s Caroline-set. 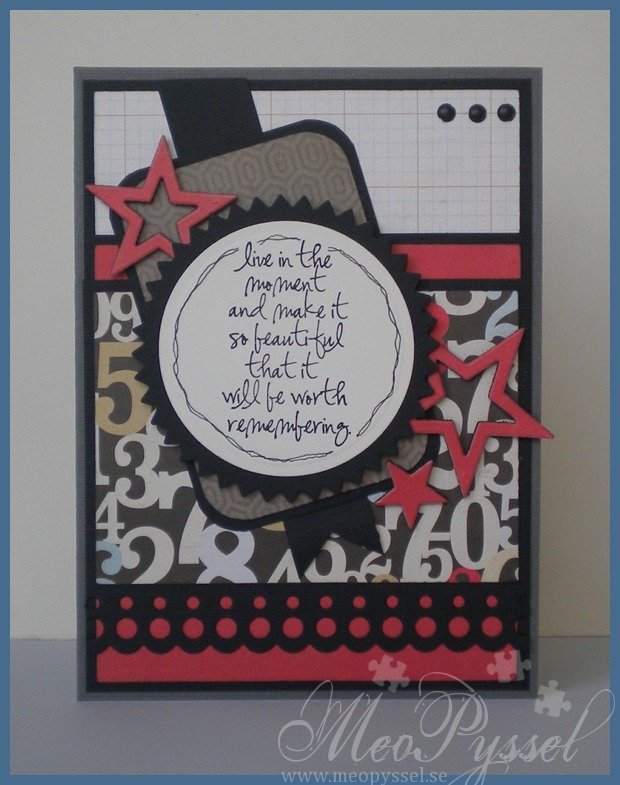 And the greeting (I love the font and text) is also from Kraftin Kimmie but from the Rachel-set. I colored all the bottletops with copics and the bottle it self it paper piced with almost all papers from the set. 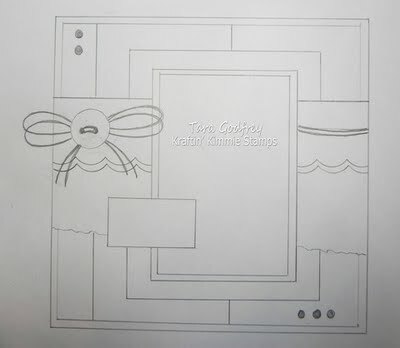 The black border i used is made using Nellie Snellen’s Lace Edge Border by cutting it twice.